One-third of internet users, or 24% of adults, has looked for weight-loss or weight-control information on the internet. This is the first survey in which the Pew Internet Project has asked this question, so there is no comparative data for previous years. 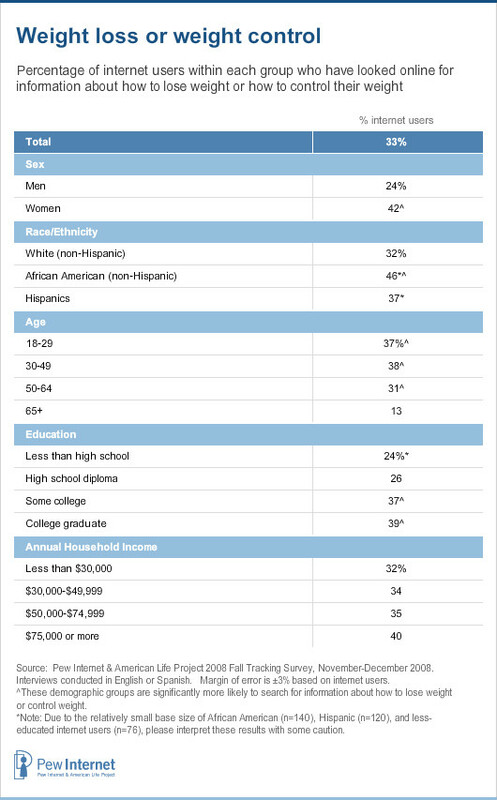 Certain demographic groups are significantly more likely than their counterparts to search for information about weight loss: online women, younger online adults, and college-educated internet users. Women are nearly twice as likely as men to say they have looked online for weight control tips: 42% of online women vs. 24% of online men. Younger internet users (ages 18-49) are more likely than older ones (age 50+) to look for weight-control information, and 50-64 year olds are more likely than internet users age 65 and older to look for this information online. Some 37% of 18-29 year-old internet users and 38% of 30-49 year-old internet users look for information about controlling their weight, compared with 31% of 50-64 year-olds and just 13% of wired seniors. Adults who have attended college are more likely than those with less education to look for fitness and weight-control information. Nearly two in five college graduates and 37% of adults with some college education have looked for information about weight control, while about a quarter of those with high school diplomas or less education look online for this type of information.